View close-up images of the front and back of an ION-based platform in actual size.. The ultra-compact ZOTAC ION mini-ITX form factor motherboard combines a high-performance NVIDIA® ION™ graphics processor with a power-efficient Intel Atom processor for the ultimate eco-friendly platform. Experience fluid and vivid high-definition playback, along with full web browsing, e-mail, and productivity on an impossibly small platform. Harness the power of 16 high-speed CUDA cores with NVIDIA® PureVideo™ HD technology for high-definition Blu-ray playback. And enjoy PureVideo™ HD technology to decode HD video formats and enhance standard-definition videos with the ION GPU for flawless HD and superior SD video playback. “Despite its tiny, Atomic roots, this could become the centre of one hell of a mighty little machine. 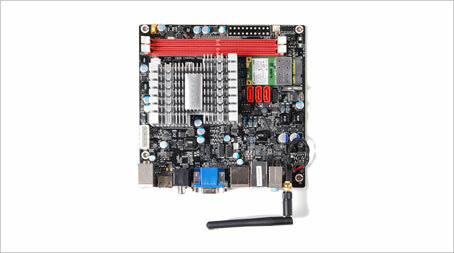 "What do I think of the world's first mini-ITX Atom Ion motherboard? I like it. Zotac did a good job of delivering pretty much everything I'd want in a board like this, going even further than expectations and offering a solution with an external power brick. The Ion worked as a real HTPC doing real duty. I was impressed." "I'd use the IONITX-A in a heartbeat. It's easily the best Atom-based motherboard around and thus TR Recommended. " "If you are looking for the lowest power consumption solution for your home theater PC it's going to be nearly impossible to best this option." "The IONITX-A's dual core Atom processor and other specs also make it an excellent potential candidate for low-power silent PC or small form factor Home Theater system."